New York City went a day without a murder on Monday, which according to police was the first time anyone could remember that happening. Overall, the city’s murder rate this year is down 23%, reaching levels last seen in 1960. This is a milestone in the 20-year-long decline of violent crime in the Big Apple. It’s cause for celebration, and Reuters reports that crime expert Tom Repetto attributes the success in part to the city’s aggressive policing strategies, the famous “broken windows” tactics that got started in the 1990s under Ray Kelly, the police chief, and have more recently included the controversial stop-and-frisk policy. But hold on a minute. Up in Boston, they also had tremendous success in cutting murder rates in the 1990s. But they didn’t focus on the broken-windows strategy, stop-and-frisk, or going after petty offenders. Instead they launched a project called “Operation Ceasefire” to cut gang violence. But hold on another minute! What’s that you say, Eric Tucker of the Associated Press? Washington, DC is likely to see its first year in decades with less than 100 murders? Wow! In the late 1980s and early 1990s Washington had over 500 murders per year. Why the decline? No single factor, says Mr Tucker. A little of this, a little of that, a little of something else you probably never even thought of. What’s the takeaway message? I’d say there are two of them. First of all, beware of takeaway messages! Lots of things in life, maybe most things, often the most important things, don’t have explanations that can be packaged as a simple, coherent thesis. Second, given our inability to explain definitively why the crime rate is falling, we may need some scepticism about the recent push to demand scientifically valid evidence for the effectiveness of social betterment programmes. Random controlled trials might very well have found that the broken-windows strategy doesn’t prevent crime, “Project Ceasefire” doesn’t prevent crime, reducing rates of single motherhood doesn’t prevent crime, family planning doesn’t prevent crime, banning lead doesn’t prevent crime, and so on and so forth; there might have been no statistically significant difference one could isolate for any of these things. And yet it seems extremely likely to me that most or all of these were good things to do! The drop in violent crime probably has to do with all of them. I want to be careful here. Crime is a complex problem, and Matt is right that lots of things can affect both its rise and fall. I happen to believe that both “broken windows” and “Operation Ceasefire” programs are effective. And yet, I think he’s 180 degrees off here. If you had lots of different cities with lots of different results, you’d be justified in thinking that lots of different things were responsible. But when you have lots of different cities all showing the exact same thing—a huge and completely unexpected drop in violent crime—does it really make sense that it’s happening for a different reason in every city? It might! But that would sure be a monumental coincidence. More likely, there’s some single factor underlying the decrease that affected the entire country. 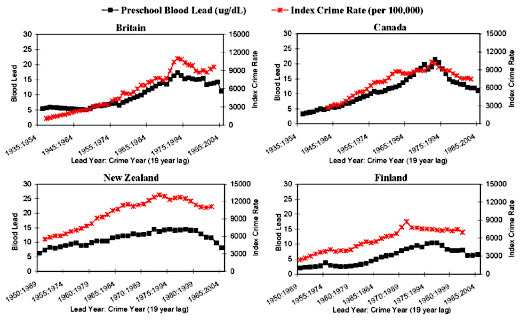 In fact, since drops in violent crime were also recorded in Canada during the past two decades, and elsewhere around the world during other time periods, it’s probably some worldwide factor. And on that score, gasoline lead reigns supreme. There’s really nothing else that persuasively explains a global rise and fall in violent crime that happens at different times in different countries. More on this later.